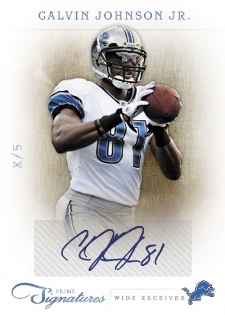 If autographs are your thing, then 2011 Panini Prime Signatures Football might be what you're looking for. A fairly straightforward release, the set is a simple mix of base cards and autographs. Based on early info, memorabilia cards are taking a break for this set. With only four cards per box, the 261-card base set is tough to complete. Among them are 86 autographed rookie cards. Collectors can also look for limited parallels, dual autographs and autographed Hall of Fame inserts. While the release does use a lot of sticker autographs, 36 key rookies who appeared at the preseason Rookie Premiere have on-card autographs. 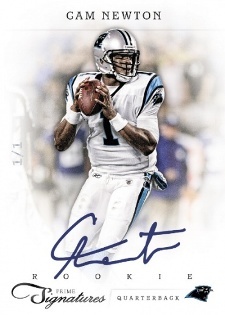 One autograph numbered to 249 or less in every single-pack box. Given the small number of cards per box, the 261-card 2011 Panini Prime Signatures base set is tough to complete. Base set includes 175 current and retired stars (/499) and 86 autographed rookie cards. The 36 players who attended the NFL Players Rookie Premiere have on-card autographs. Base set parallels: Prime Signatures Silver (/75), Prime Signatures Gold (/25), Prime Signatures Platinum (/5 or less), Prime Signatures Black (/1) and Printing Plates Signatures (/1). 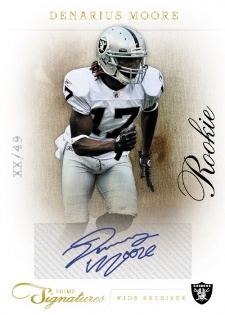 Rookie Signature parallels: Silver (/199), Gold (/49), Platinum (/25), Black (/1), Printing Plates (/1). Singing Bonus Signatures (/49 or less) feature two autographs. Players enshrined in Canton are in the Call to the Hall Signatures set (/49 or less). 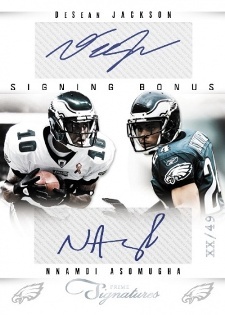 Collectors can also look for Call to the Hall Combo Signatures /25 or less). All cards printed on thick 72-point card stock. Case breakdown (30 boxes): eight or nine on-card rookie autographs, ten or 11 rookie sticker autographs, ten or 11 current and retired star autographs. With only 4 cards in box it is hard to get a good hit for the price. Cards themselves are good looking but low bang for the buck.